Fitting over a wide range of currents is more robust than fitting over the narrower range that I can get with just one value for R2. 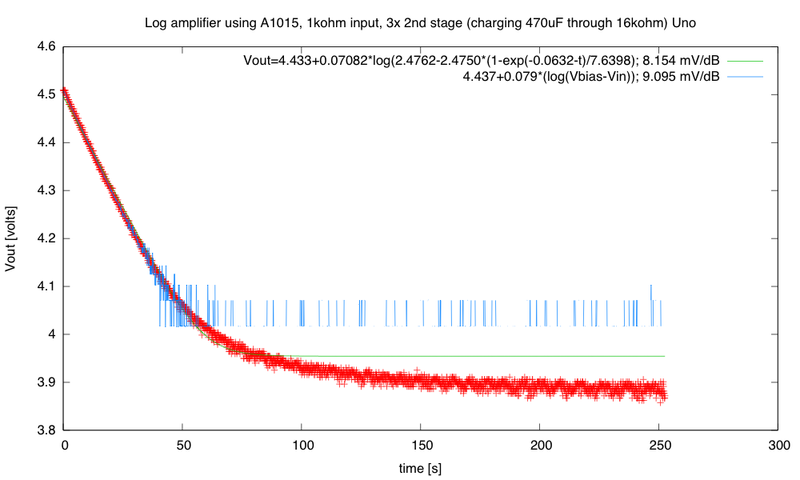 There is quantization error still on the voltages, but the overlapping current ranges give good data for most of the range. VT is now 26.1mV and IS is 0.91µA. Base-emitter diode for the S9012 PNP transistor (collector and base connected together). VT is 25.3mV and ISO is 13.4fA. Characteristics for the base-emitter diode of the S9013 NPN transistor (collector and base connected together). VT is 25.5mV and ISO is 8.85fA. For both transistors, the region where the logarithmic fit is good is from about 0.5µA to about 50mA (maybe only 35mA for the NPN transistor). 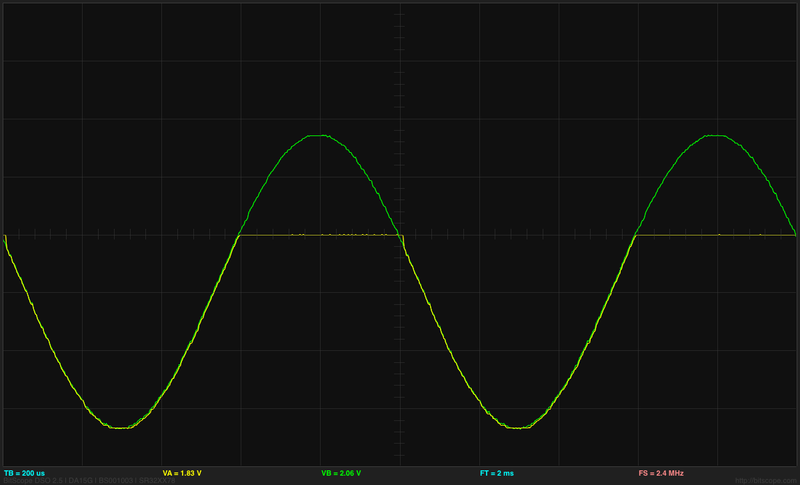 That gives about a 100dB working range for a log amplifier, if the largest current corresponds to 50mA. 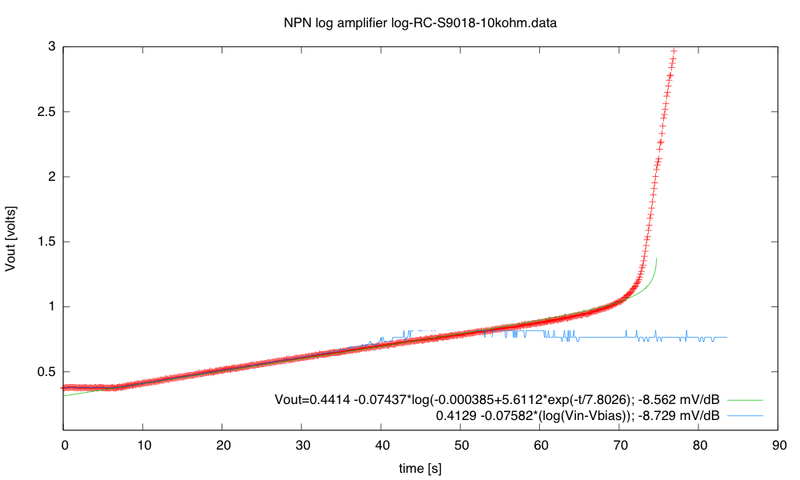 Of course, the op amps that are driving the input of the log amplifier don’t have that much drive capability, and we are probably limited to about 20mA—only a 90dB dynamic range on the log amplifier. Yesterday, I spent the day testing different transistors in the log amplifier, to see whether it made much difference which transistor I used. I wanted to test all 11 transistors in the iteadstudio assortment, the 5 PNP transistors and the 6 NPN transistors, to see if it made much difference and whether one of the transistors would give me a larger mV/dB scaling than the others. 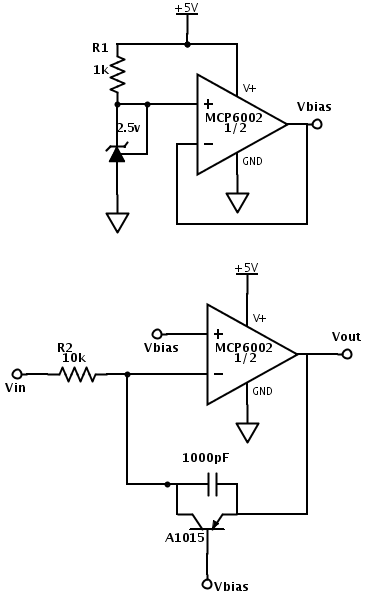 (click image to embiggen) The same circuit can be used for either NPN or PNP transistors. The only difference is whether the 470µF capacitor starts at 0v (for PNP) or 5v (for NPN) before decaying to Vbias through the 16kΩ resistor R5. For many of the tests the voltage-to-current resistor R2 was 1kΩ rather than 10kΩ. The op amp at the top is a unity-gain buffer to provide a steady Vbias source that capable of providing some current (unlike the TL431ILP voltage reference shown here as an adjustable Zener diode). 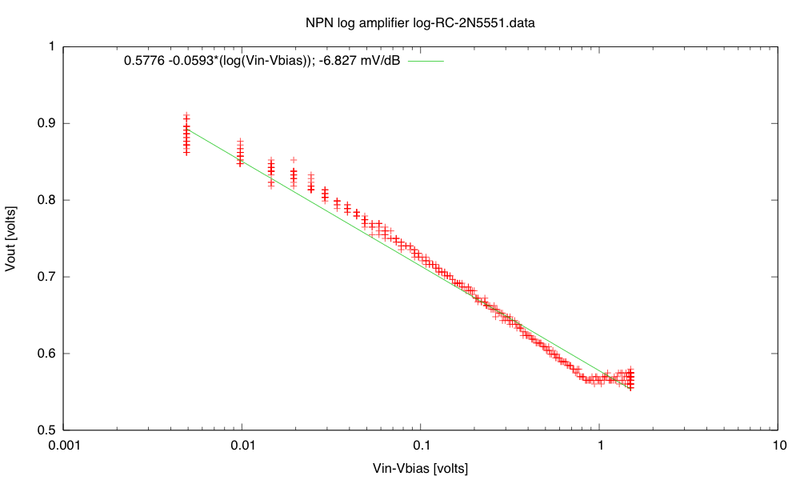 The nominal 2.5V reference was closer to 2.48V, which is within the ±2% spec for the part. 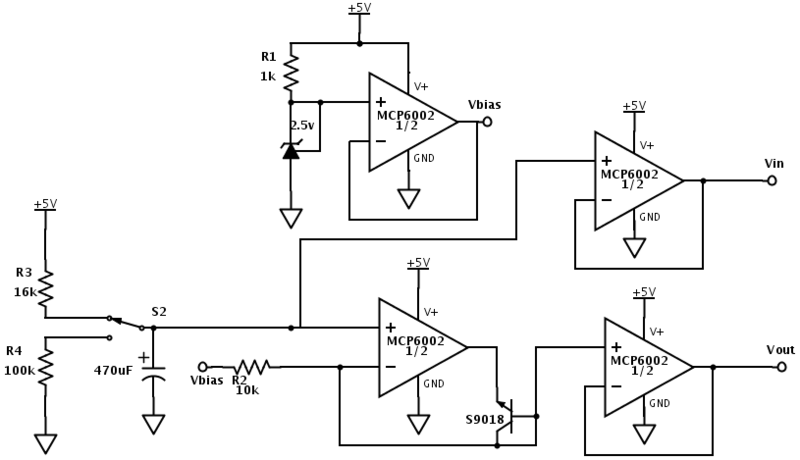 The right-hand op amp is just a non-inverting amplifier with 3× gain, to get better precision on measuring the output voltage with the Arduino ADC. 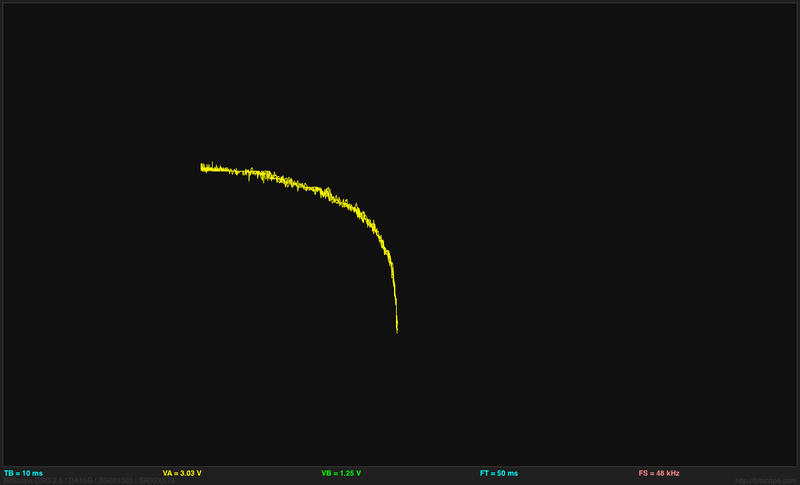 I made some measurements with Vout but most with the 3Vout signal. The scaling factor was 3.0 much more accurately than the repeatability of my fits to the data, so the gain in precision was not accompanied by a loss of accuracy. 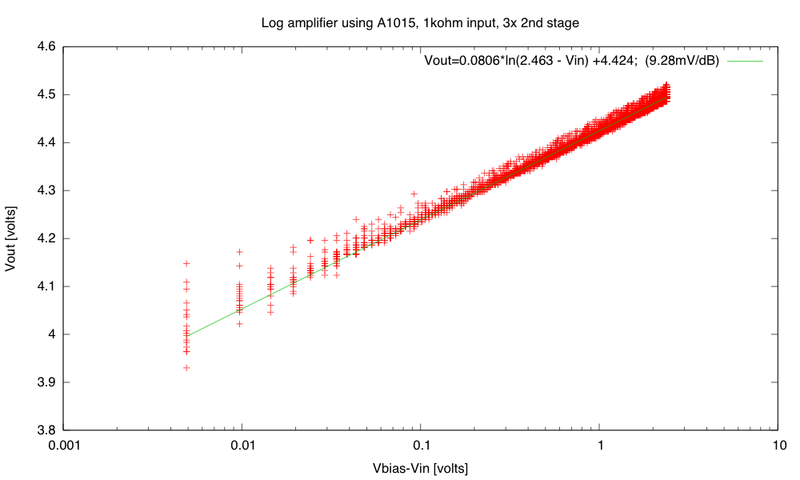 Ideally, I’d like to be able to use more than a 3× gain in the final stage, to get better precision, but I’m limited by the offset voltage of the log amplifier, which is determined by the transistor and by the voltage-to-current converter R2. Assuming that βR and IS are constant, and that VBE is very large compared to VT (about 23 times bigger in my measurements), we have the desired exponential relationship: for some constant x. 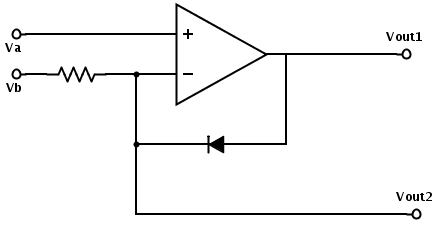 Note that if we leave the –1 in, then we’ll have a small DC offset to iC. 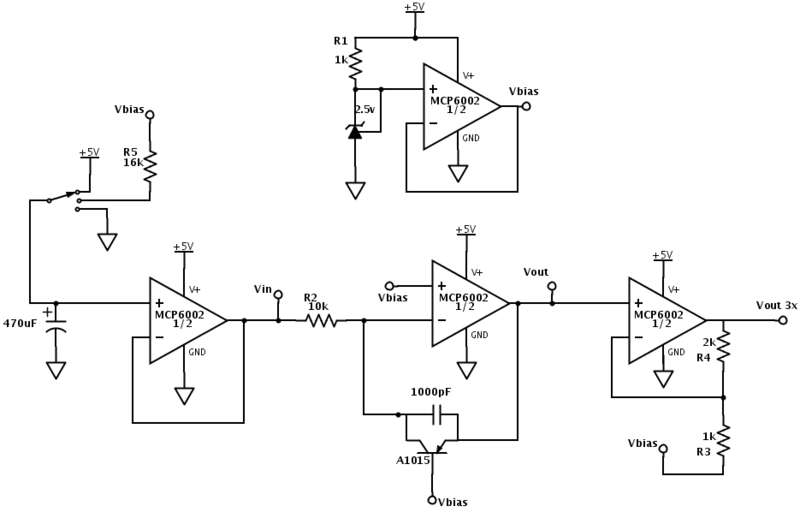 The log-amplifier output is temperature-dependent, since , which is about 26mV at 300˚K. The scale factor can be multiplied by ln(10) to get 60mV/decade or 3mv/dB. Note that this scaling is not affected by the current gain β of the transistor—that only affects the offset of the output voltage. 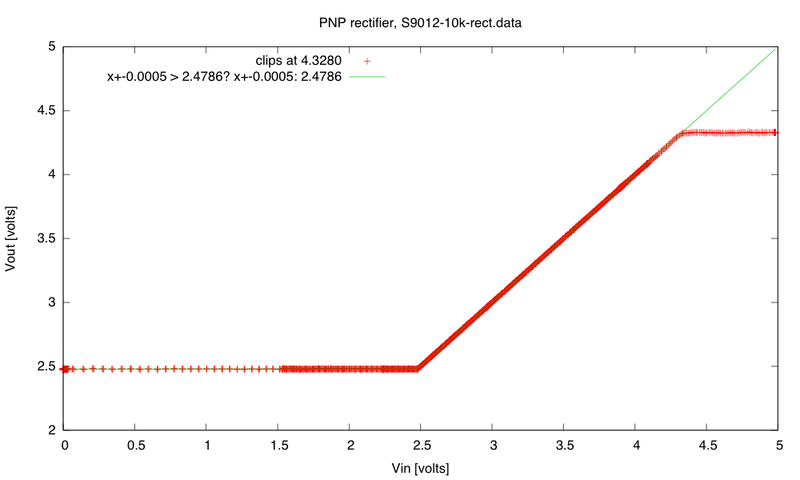 This analysis agrees with the statement in Wikipedia, “At room temperature, an increase in VBE by approximately 60 mV increases the emitter current by a factor of 10.” There is probably an even bigger temperature dependence for the offset of the output than for the scaling, because of changes in βR and IS, but that is not included in the Ebers-Moll model. 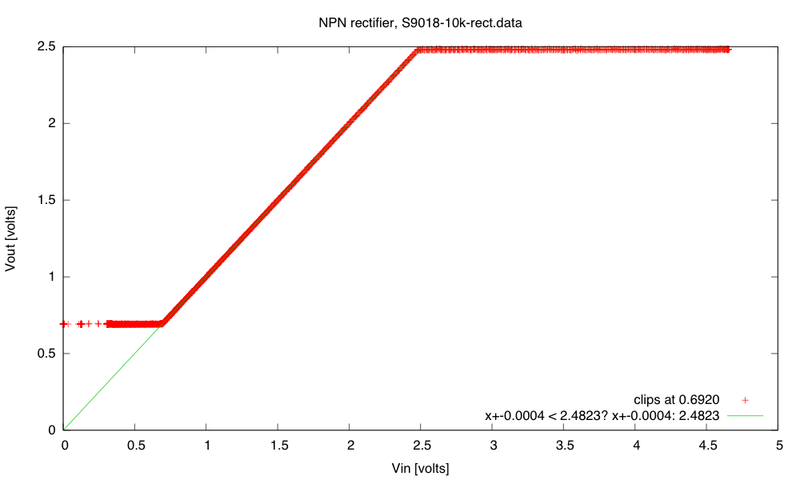 The theoretical result indicates that I should get about 3mV/dB for any transistor, but that the offset voltage will vary depending on the characteristics of the transistor. I might also run into effects not included in the Ebers-Moll model, especially at very large or very small collector currents. Adjusting R2 to change the current can move the output offset around. If I make R2 large and the current small, then VBE will be small, and the approximation will be poor. If I make R2 small, the current may exceed what the transistor is designed for and there may be saturation effects. 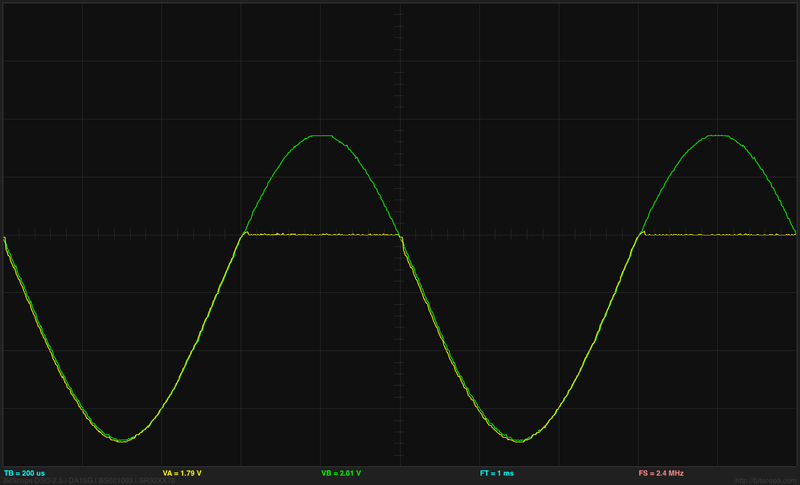 Looking at typical collector currents on the I-vs-V plots for the transistors, I’m seeing values like 8–20mA at the high end, so with a 2.5V drop across R2, I want R2 to be at least 300Ω. Initially, I picked 1kΩ, as providing a large current at 2.5V, hoping that this would give a large dynamic range. 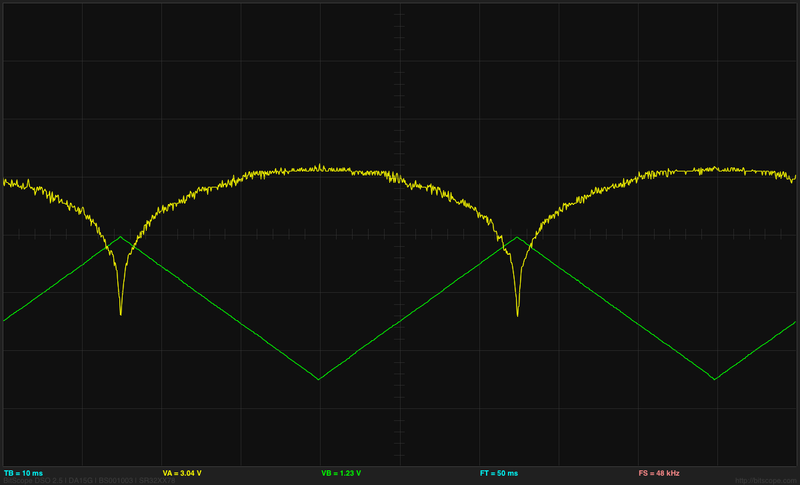 Here are a couple of good examples of measurements using the 3× output and R2=1kΩ. 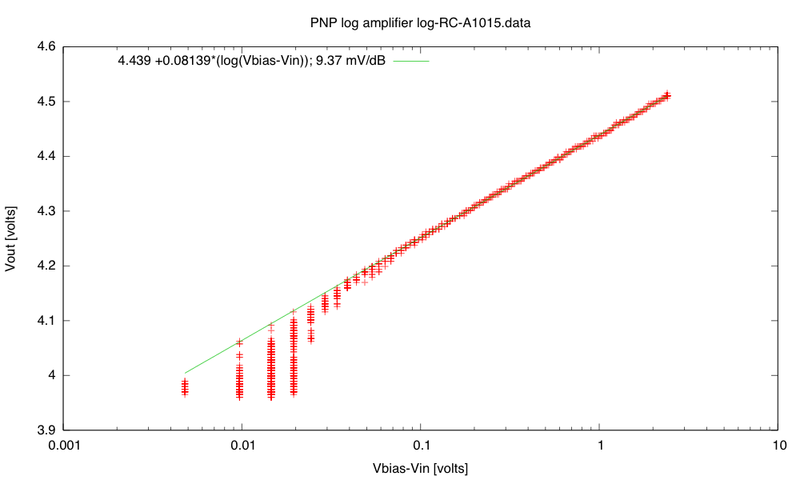 (click image to embiggen) Typical 3× Vout vs Vin curve for a PNP transistor, here the A1015, using R2=1kΩ. 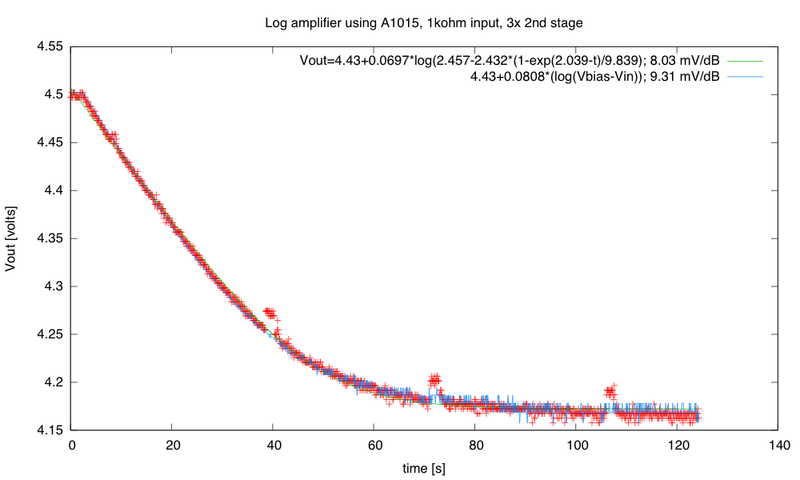 This uses Arduino-measured Vin, Vout, and Vbias, so is limited to about 2 decades (40dB). (click image to embiggen) Typical 3× Vout vs. Vin curve for an NPN transistor, using R2=1kΩ. 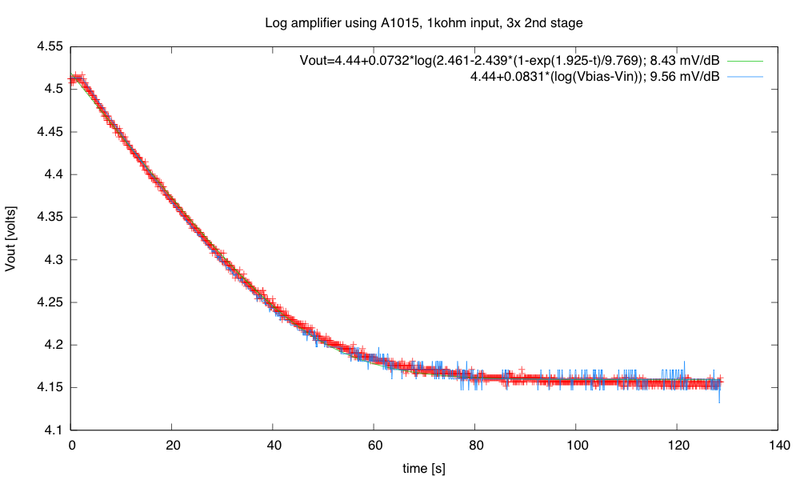 Again we’re limited by the Arduino ADC to about 40dB of dynamic range. Fitting the constants for this turns out to be difficult, because v3 is close to zero. If it were exactly zero, the formula would be , and we could make arbitrary tradeoffs between v2 and RC. 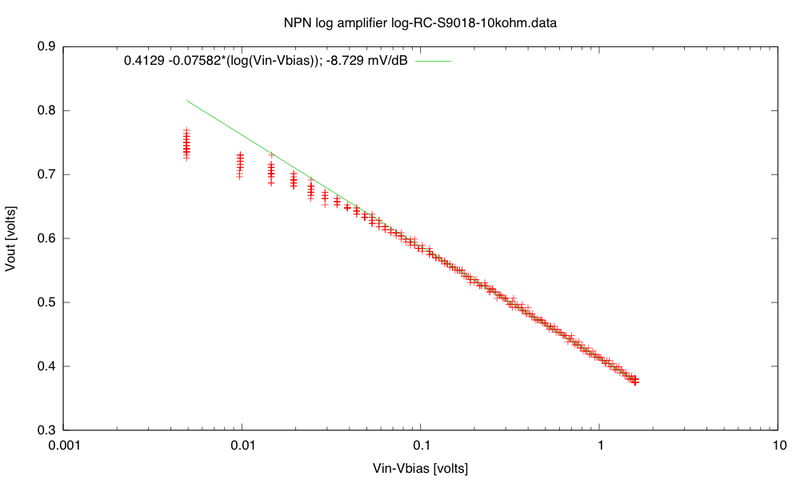 (click picture to embiggen) The S9013 log amplifier shows what looks like a good fit over about 80dB, when using R2=1kΩ, and good linearity for about 65dB. The upward tail shows where the collector-base junction begins to be forward biased, and the current is no longer controlled by the base-emitter voltage. Note that this curve shows that the problems we had with direct measurement of RC discharge curves in the physics lab was due to limitations of the Arduino ADC, not to the underlying RC circuit. 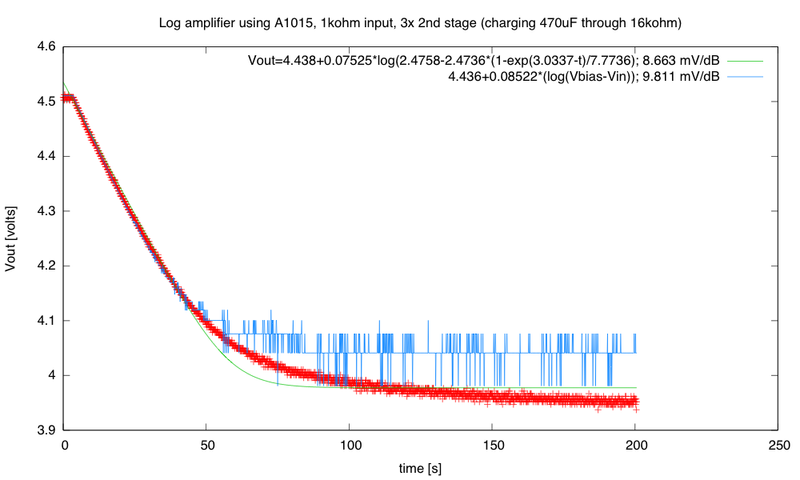 The tails of the discharge continue to follow the exponential well beyond the resolution of the 10-bit ADC in the Arduino. 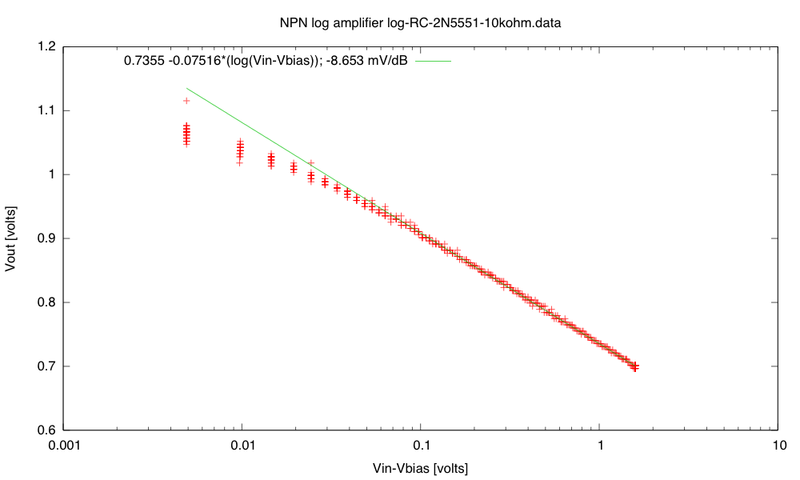 (click image to embiggen) Not that the 2N5551 Vout vs Vin curve is not a simple logarithm—there is some sort of saturation happening for large input voltages, so the straight-line fit is awful. (click image to embiggen) With a 10kΩ resistor, the currents through the 2N5551 transistor are smaller, and no clipping occurs. (click image to embiggen) With R2=1kΩ, the S9018 transistor shows a flat spot in the response for 277mV < Vin-Vbias < 330mV (that is, 277uA < IC < 330uA) . I have no idea what causes this flat spot. 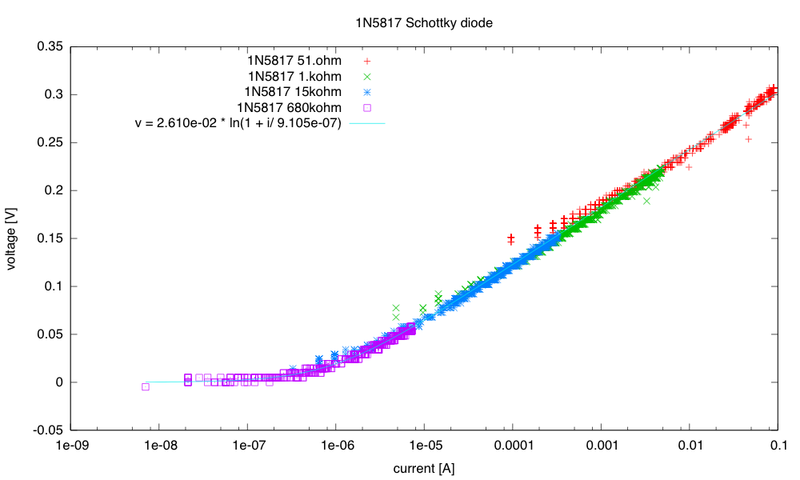 I’m still mystified by the flat spot in the S9018 response—anyone have any ideas?? 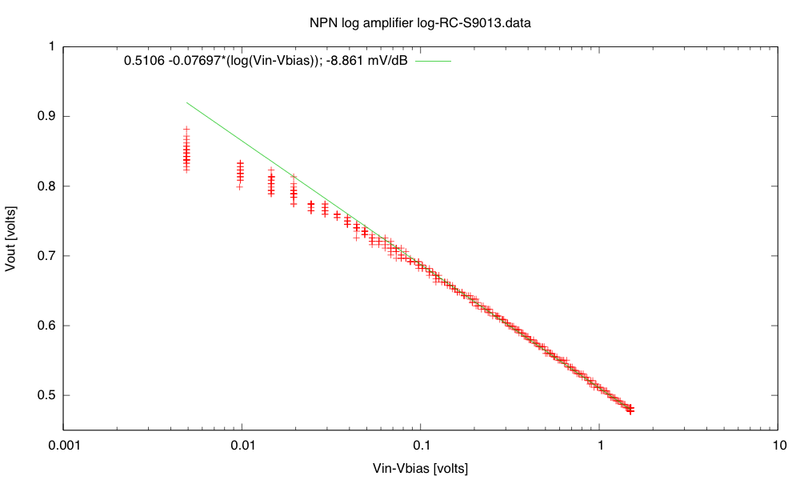 (click image to embiggen) With R2=10kΩ, the response of the amplifier with a S9018 transistor is nicely logarithmic. 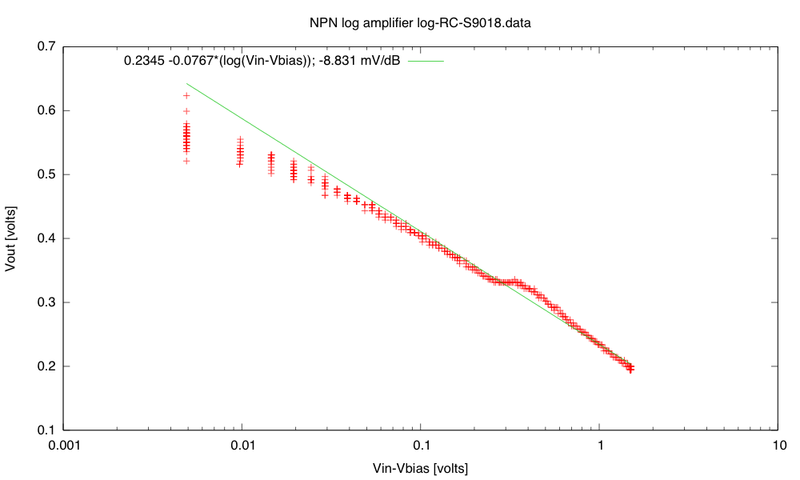 (click to embiggen) With R2=10kΩ, we get a good fit for about 76dB on the S9018 transistor. The larger resistor gives a somewhat softer turn on for the transistor if we go past Vbias. 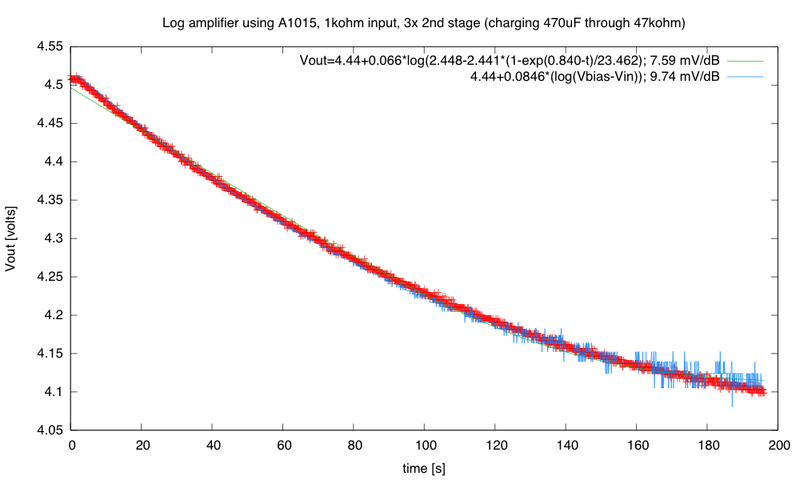 All of my transistors gave mV/dB scaling that was about the same (just under 9 mV/dB after the 3× gain, so just under 3mV/dB for the unamplified output), as is predicted by the Ebers-Moll model. 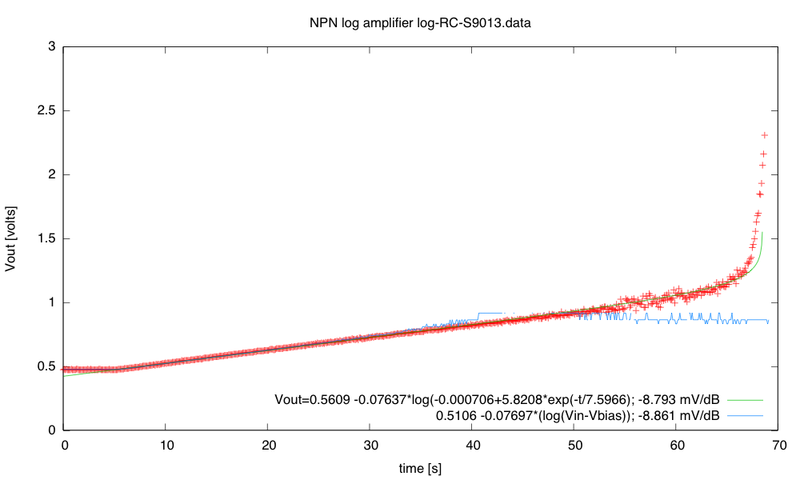 I got better dynamic ranges for the NPN transistors than for the PNP transistors, but this may have been due to artifacts of the test setup. 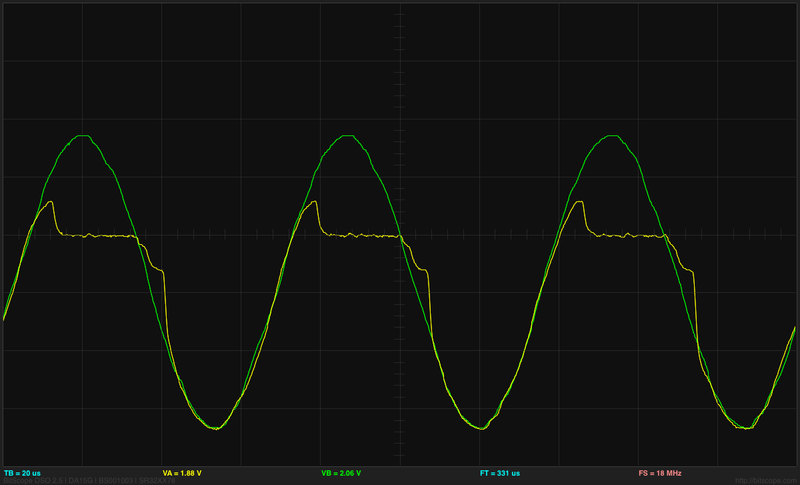 In any case, it looks like 60–70dB ranges are fairly easily achieved. If one were to try to make a measuring instrument with a log amplifier, there would have to be some temperature compensation as the log-amplifier offset and scaling are both temperature sensitive. 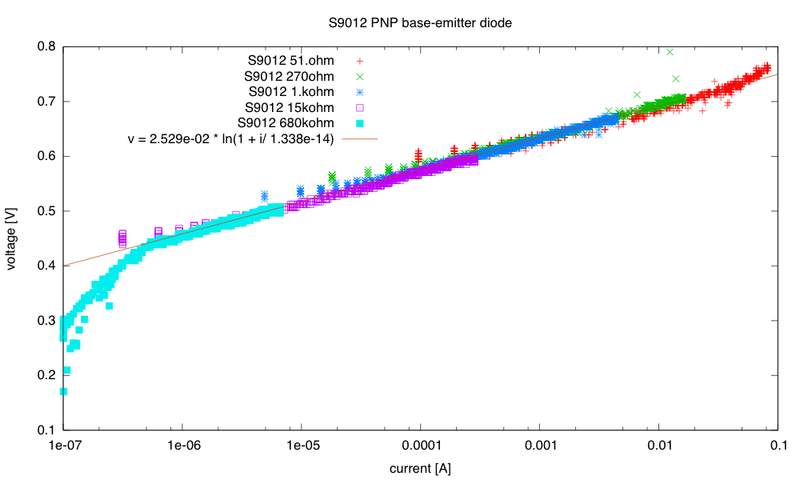 Having a temperature-independent voltage source for calibration would be a good idea. 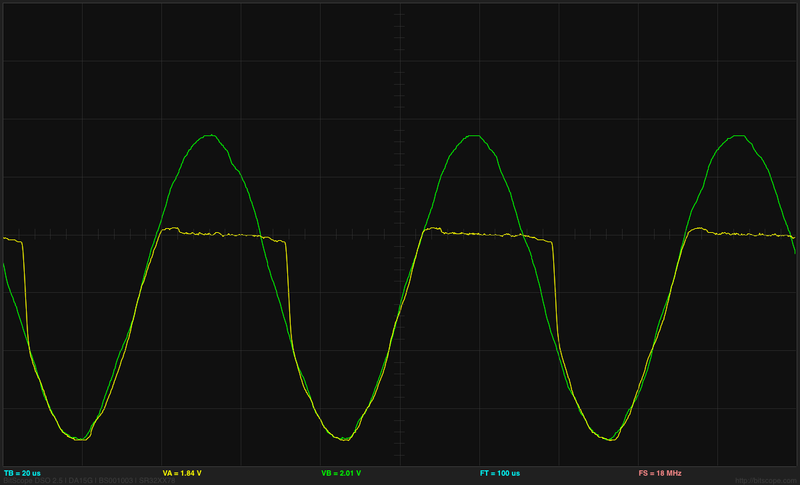 I think I’m about burned out on log amplifiers now. Perhaps later his week I’ll try doing some precision rectifier circuits.